"How many of you have ever taken a bus? At bus shelters, what do you see?" 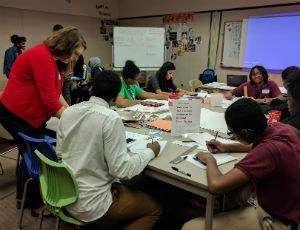 This is just one of the thought-provoking questions posed by the Chicago Architecture Foundation to teens at Thurgood Marshall Branch YOUmedia earlier this month. The event was part of the Chicago Biennial, in which teens were challenged to design a bus shelter ad about their community—emphasizing the past, present and future of their community—but also highlighting their neighborhood as a unique and important place to visit. Encouraged to study other bus shelter ads and to consider various design concepts, teens began to sketch and create collage ideas for their bus shelter. A big fan of the Amulet series, Keon plans to create a comic book shelter ad depicting someone from his neighborhood—a photographer, in particular—who travels around the world, but comes back to the neighborhood and has a changed, positive perspective. Sean and William envision a three-person bike going through past, present and future of Thurgood Marshall/Auburn community. They envisioned bright green grass in the past, dying grass in the present and a future including robots and a lot of steel imagery. Ta'Niya expressed a feeling of discouragement about the past and present conditions of her neighborhood, but has hope for the future. On her bus shelter, she'd like to see "bright colors"—maybe school colors—and "happy faces" of people in her neighborhood getting their diplomas and being successful. 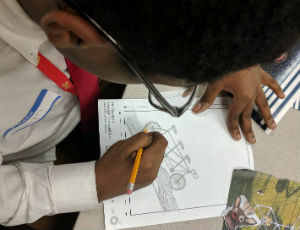 This challenge is part of a citywide BP Student Design Competition for ages 10 and up through November 30. Each month we spotlight a teen (or teens) at CPL. 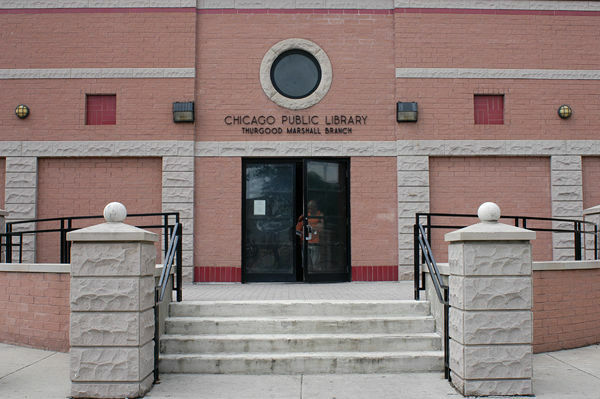 Share your story and and adventures at the library with us at teenservices@chipublib.org.